Rouen is the artistic center of the region of Upper Normandy, with many good museums to entice the visitor. 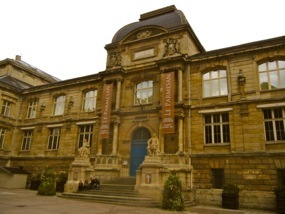 The Musée des Beaux-Arts (Fine Arts Museum) in Rouen has a large and high quality collection, particularly of paintings from the 15th to the 20th centuries. Unlike the large museums in Paris, the Musée des Beaux Arts is usually not crowded. Visitors can stroll through the museum at leisure, enjoying the many works of art. Just across from the Musée des Beaux-Arts is a lovely small park, with many different kinds of trees and shrubs, a small pond complete with swans, and benches. It's a great place to relax and unwind in the midst of a busy day of sightseeing. Rouen is also home to the Museum of Ceramics (Musée de la Céramique). Rouen Faïence (glazed colored ceramics) is well known in France, and this museum presents historical and modern examples. Note that it has been involved in a large-scale renovation, and parts are still closed. Joan of Arc is recognized in a couple of museums. The small Musée Jeanne d'Arc, in the Place du Vieux Marché, present wax figures and other representations of her life and times. The Tour Jeanne d'Arc, in the Château de Rouen, the former keep of the castle of Phillipe Auguste, also has a small museum devoted to her. The tower itself is impressive and visible as you leave the train station. Other more specialized museums include the Musée Pierre Corneille, in the house where the playwright was born. The museum has period furniture and a lovely library. The Musée Le Secq des Tournelles houses 8000 pieces of ancient ironwork, displayed in a former church. The works range from Roman times to the 19th century. Le 180 is Rouen's place to go to see contemporary art. Located near the Aître de St-Maclou on rue Martinville, this museum offers changing exhibitions. Above, Musée des Beaux-Arts, Rouen, France. 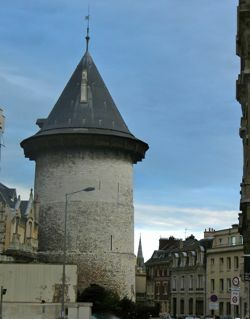 Below, Tour Jeanne d'Arc, in the Château de Rouen, where Joan was imprisoned.